“Comets are vile stars. Every time they appear in the south, they wipe out the old and establish the new. Fish grow sick, crops fail, Emperors and common people die, and men go to war. The people hate life and don’t even want to speak of it.” -Li Ch’un Feng, Director, Chinese Imperial Astronomical Bureau, 648, A.D. In 2007, a meteorite fell in Puno, Southeastern Perú. José Macharé – scientist of the Geologic, Mining and Metallurgic Institute in Perú – said that the space rock fell near a muddy area by Lake Titicaca, making the water boil for around ten minutes, and mixing with the soil and emanating a gray cloud, the components of which remain unknown. Having discarded radioactive poisons, this toxic cloud is said to have caused headaches and respiratory problems in at least 200 persons from a population of 1500 inhabitants. Other than this event, how often do we hear about people getting sick due to a rock coming from space? How about birds, fish or other animals? 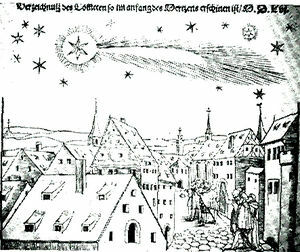 Ancient astrologers cite comets as ill omens of death and famine, but are there any other causes other than the ones due to physical/mechanical consequences of comet impact devastation in our fragile environment of which we should be aware? As a physician, I usually concentrate strictly on medical and health-related issues, not history or catastrophism. However, like so many other people, I see signs of atmospheric changes on our planet which, according to many experts, may well be due to increasing comet dust loading. When I read about increasing reports of fireballs all around the world, and I know that these factors must have an effect on the health of individuals and societies, it motivates me to do the research to find the connections so that I am better prepared for what may lie in our future. If our planet is entering a new cometary bombardment cycle, and if these comets harbor new species of microbes unknown to mankind’s collective immunological systems (as may well be the case), then being forewarned is being forearmed. Mainstream science scoffs at the idea that if there is life such as bacteria and viruses in space, some of it would naturally fall to Earth. While some researchers agree that comet dust may harbor organic matter, they argue that even if the dust did reach Earth’s atmosphere, a fiery entry would make all organic matter’s survival questionable. But in a study published in the journal Meteoritics and Planetary Science , it is detailed that amino acids – the building blocks of life – were found in a meteorite where none were expected. Why? Because this particular meteorite formed when two asteroids collided, the shock of collision heating it to more than 2,000 degrees Fahrenheit – hot enough that all complex organic molecules like amino acids should have been destroyed. They found them anyway, and their study cites the possibility of sample contamination being highly unlikely. In addition to amino acids, they found minerals that only form under high temperatures, indicating that they were indeed forged in a violent collision. Jennifer Blank of SETI has done experiments with amino acids in water and ice, showing they can survive pressures and temperatures comparable to a low-angle comet-Earth impact or asteroid-asteroid collision. … in 2005, scientists from the Armed Forces Institute of Pathology in Washington, D.C., resurrected the 1918 virus from bodies that had been preserved in the permanently frozen soil of Alaska. They soon discovered that a completely new virus had combined with an old virus, exchanging and recombining genes, creating a hybrid that transformed mild strains of the flu virus into forms far more deadly and pathogenic. They also confirmed that the 1918 Spanish flu virus originated in the sky, first infecting birds and then spreading and proliferating in humans. Joseph argues that cometary debris, and the smaller particles and any microbes and viral particles attached to cometary debris impacting earth, fall upon the upper atmosphere and then slowly drift upon the air currents, sometimes staying aloft for years, crisscrossing the planet and gently falling downward, until finally making a soft landing on whatever is beneath them – be it ocean, river, animal, plant, or woman and man. In fact, it is known that microorganisms exist in significant concentrations in Earth’s atmosphere, and they have been found in air samples collected at heights ranging from 41 km to 77 km. The natural mechanisms which transport microorganisms into the atmosphere are storms, volcanoes, monsoons, and cometary impact events. We know that the Tunguska object exploded in the atmosphere in June 1908, but it was not until 1927 when scientists finally made it to the impact area in Siberia. No visible fragments of the exploded body were found, but later fieldwork uncovered peculiar black, shiny, metallic spheres in the soil of numerous small, shallow, oval craters – 50 to 200 meters in diameter – similar to the craters of the Carolina Bays. These spheres were typical of extraterrestrial bodies having a composition very high in iridium, nickel, cobalt and other metals, and an unusually high content of these same metals were later found in Antarctic ice cores – but in the layer relating to the year 1912. That is to say, it took four years for these metals deposited in the stratosphere to precipitate onto Earth. Was the Tunguska object a source of new strains of virus never seen before on Earth? Joseph reminds us that microbes which flourish in the cold are this planet’s most successful colonizers. In fact, they are perfectly adapted to a life on some frozen astral object traveling through space. “The long-term impact of subzero temperatures should be regarded not as extreme and limiting but rather as a stabilizing factor supporting the viability of microorganisms” (D. A. Gilichinsky, “Permafrost Model of Extraterrestrial Habitat” in G. Horneck & C. Baumstark-Khan, Astrobiology, Springer, 2002). Supporting this, it is known that Richard Hoover of NASA discovered microorganisms in deep ancient ice cores over 4,000 years old, drilled from Lake Vostok, near the south pole. These creatures were found in association with ancient cosmic dust particles which had fallen from space. Moreover, microbes recovered from Lake Vostok increase in number with increasing numbers of dust particles (S. Abyzov et al., Microbiologiya, 1998, 67: 547). They argue that microbes and viruses can exchange and acquire DNA, and this argument is supported by a recent study published in Nature Communications  which sheds light on how bacteria incorporate foreign DNA from invading viruses into their own regulatory processes. Thomas Wood, professor in the Artie McFerrin Department of Chemical Engineering at Texas A&M University, explains how viruses replicate themselves by invading bacterial cells and integrating themselves into the chromosomes of the bacteria. When this happens, a bacterium makes a copy of its chromosome, which includes the virus particle. The virus can then choose at a later time to replicate itself, killing the bacterium. Having already integrated itself into the bacterium’s chromosome, the virus is subject to mutation as well. There is compelling evidence that the Black Death was not an outbreak of bubonic plague, but was in fact caused by a hemorrhagic virus. This case is synthesized in the book Return of the Black Death , in which Susan Scott and Christopher Duncan from Liverpool University carefully put all the available clues together, tracking the plague from its first appearance out of nowhere and chronicling its unprecedented catastrophic effects on European civilization – death on a scale that is unimaginable, but could very well happen again, at any time. – An outbreak is recorded as being started by a traveler or stranger or by an inhabitant who had returned from a place where the plague was known to be raging. 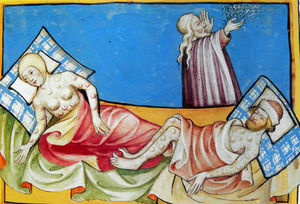 – The plague behaved in exactly the same way in each outbreak. – There were, however, two different types of epidemics in England, governed by size and density of the population. – The full-blown typical epidemic lasted for eight or nine months – from spring to December. – The mortality rate was often about 40% of the population, although they had no measure of how many people had fled at the first signs of trouble. – Latent period: 10 to 12 days. – Total infectious period: about 27 days, assuming that the victim remained infectious until death, although it is possible that infectiousness decreased once the symptoms appeared. – Average time from the point of infection to death: 37 days. The authors were astonished when they were able to work out the duration of these statistics in more than 50 different plague outbreaks in England and to verify the length of the latent and infectious periods many times. 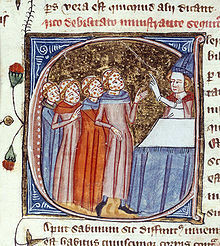 The correspondence with the universal 40-day “quarantine” period established as successful prophylaxis during the time of the plague supported their conclusions. From the data available in other countries, they argue convincingly that these statistics applied to the Black Death in all of Europe. It was evident that the key to the success of the plague in the Middle Ages lay in its exceptionally long incubation period. – A victim usually displayed the symptoms for about five days before dying. But according to contemporary accounts, this period could have been between two to twelve days. – The main diagnostic feature was the appearance of hemorrhagic spots, often red, but ranging in color from blue to purple and from orange to black. They often appeared on the chest, but were also seen on the throat, arms and legs and were caused by bleeding under the skin from damaged capillaries. These were so-called “God’s tokens”. – Various swellings were also characteristic of the disease: carbuncles, blains (burning ulcers) and the the buboes, which were swollen lymph glands in the neck, armpits and groin. If the buboes failed to rise and burst, there was little chance of survival, but if they broke the fever apparently declined. – Fever, continual vomiting, diarrhea, and prolonged bleeding from the nose were additional characteristics. Also, blood-tinged urine, a burning thirst, and in some, madness and delirium. – Autopsies revealed generalized necrosis of the internal organs. It was surely a gruesome way to die. The victim was killed by the literal death and liquefaction of the organs. … it is known that the Black Death was carried across the sea to Iceland and that there were two severe and well-authenticated epidemics in the fifteenth century. […] Yet it is known that no rats were present on the island during the three centuries of the Black Death. Infections continued through the winter when the average temperature was below -3 degrees Celsius, where transmission by fleas is impossible. It is also agreed that there is no mention in any of the accounts of rat mortality during the Black Death. A temperature of between 18 degrees and 27 degrees Celsius and relative humidity of 70% are ideal for flea egg-laying, whereas temperatures below 18 degrees inhibit it. Researchers had collected all the available climatological data for central England during the Black Death and at no time was the average July-August temperature above 18.5 degrees Celsius. 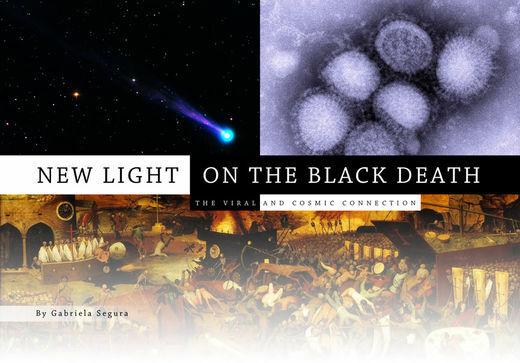 Scott and Duncan note certain factors that narrow the causative agent of the Black Death down to a virus. The infectious agent also appeared to have been remarkably stable; if there were mutations, these didn’t change the course of the disease, at least not for 300 years. The plague was believed to have been passed by droplet infection; it was considered to be safe if one kept at least 4 meters (13 feet) away from an infected person out-of-doors. Most interesting of all, there exists a strong genetic selection among European populations in favor of the CCR5-Δ32 mutation. This mutation results in the genetic deletion of a portion of the CCR5 gene which codes for a protein that is an entry port used by some viruses. This mutation makes a homozygous carrier resistant to HIV-1 virus infections, and may have made them resistant to the Black Death. 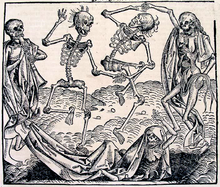 No known virus existing today is responsible for the Black Death, although the symptoms resemble those of Ebola, Marburg and the viral hemorrhagic fevers – diseases caused by filoviruses. They have a high mortality rate and tend to occur in explosive epidemics driven by person-to-person transmission. Outbreaks occur unpredictably and, as of yet, no animal reservoir is known. Baillie compared tree rings to dated ice-core samples that had been analyzed, discovering ammonium. Now, there is a connection between the ammonium in the ice cores and extra-terrestrial bombardment of the surface of the Earth on at least four occasions in the last 1500 years: 539, 626, 1014, and 1908 – the Tunguska event. 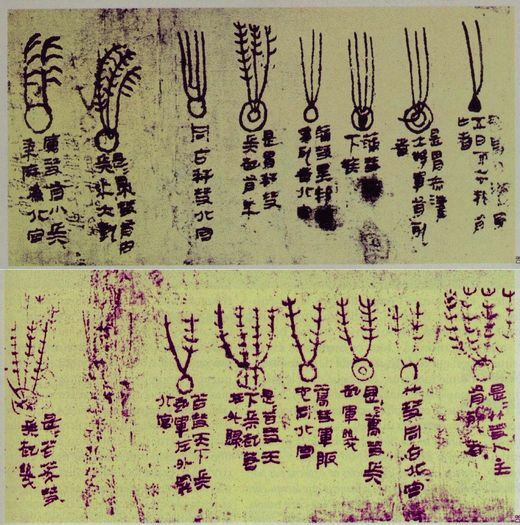 Baillie shows that the exact same signature is present at the time of the Black Death in both the tree rings and in the ice cores, but also at other times of so-called “plagues and pandemics”. Baillie points out that earthquakes could be caused by cometary explosions in the atmosphere or even by impacts on the surface of the earth. In fact, the ammonium signal in the ice-cores is directly connected to an earthquake that occurred on January 25th, 1348. He correlates this with accounts of the 14th century that the plague was “corruption of the atmosphere” that came from this earthquake. The concept of astral bodies grazing the Earth’s atmosphere or impacting Earth directly, depositing microbes and viruses on Earth which may combine with Earthly microbes producing new strains of viruses and contributing to evolution and diseases, is daunting to say the least. What can we possibly do to counteract such infectious threats? Could dietary changes influence the appearance and disappearance of diseases? We know that grains are sources of gluten, a protein which is quite difficult to digest and to which increasing numbers of people are intolerant due to its modern hybridization for industrial purposes. Anti-nutrients such as lectins in grains are known to be toxic. The lectin of wheat is known to be pro-inflammatory, immunotoxic, neurotoxic, cytotoxic, cardiotoxic and may interfere with gene expression, disrupt endocrine function, may adversely affect gastrointestinal function and – surprise – lectins share pathogenic similarities with certain viruses. A population with bread as a staple food is unquestionably susceptible to disease and, ultimately, pandemic. 11. Sayer Ji. Opening Pandora’s Bread Box: The Critical Role of Wheat Lectin in Human Disease. Journal of Gluten Sensitivity, Winter 2009.